Reader's Digest CA - 05.2019 » Download PDF magazines - Magazines Commumity! 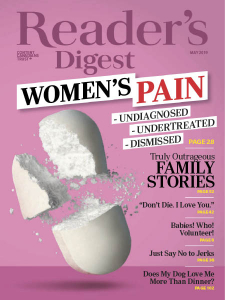 Inspiring real-life stories, laugh-out-loud humour, and insightful articles about health, lifestyles, and truly remarkable Canadians, Reader's Digest touches your life and connects you to the world around you -- now that's "life well shared". Canada's most read, most trusted magazine.